This hip, new design of the classic kids prop, Forgetful Freddie, is perfect for today's children's performer. You begin the routine by displaying a 23" tall (a smaller size is available, also) full-color figure of "Freddie" as you tell the kids about how hard he works in school, what a great friend he is to others, and how he's even learning magic tricks. His only downfall? He's forgetful! You tell the kids, "Sometimes he forgets where he puts his shoes. Sometimes he forgets to say thank you. But one day, he was so forgetful, that he forgot where he put his head!" You remove his head from his torso, and it magically vanishes. But Freddie needs something on his shoulders. Hmmm? His mother inflates a balloon and off to school he goes only to be teased by the children, "Balloon Head, Balloon Head! Freddie is a Balloon Head," they taunt. This is the beginning of this wonderful tale. When AmazeKids' Danny Orleans performed this at birthday parties, it was a full-blown seven-minute story filled with group audience participation, loads of laughs and a nice reminder to always remember to consider the feelings of others. 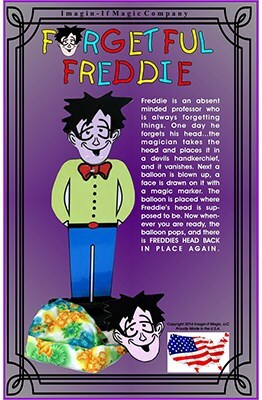 At the story's end, when Freddie uses magic to solve his dilemma, the balloon pops and, in a flash, his head appears and all is right with Freddie's world. Forgetful Freddie is available in two sizes: 23" for large audiences and 12" tall for small audiences. Choose the size that's right for you. If you'd like the entire script for Danny Orleans' routine, please contact us at AmazeKids and we'll email it to you. Then you'll have everything you need to present one of the great kid show routines, a presentation which really captures the attention of young audiences everywhere.